Another morning, another two Morrisons Apple and Blackcurrant pies for pudding as Pierateer RAS kept up his #piepledge of having a pie a day. However with the Badminton not kicking off until 5pm that evening, there was op-pie-tunity to get a cheeky pie in town with his friend Adam before they went to the National Indoor Arena. And with it being Friday Pieday, there was no excuse for buying anything else for lunch. So after having been out of the pie-eating circuit for a long three hour stint between 10am and 1pm (following dental treatment which involved having a numb mouth for a few hours – not ideal for eating hot pie with!!! ), Pierateer RAS was looking for a good pie to test his new filling out on! Being in the centre of Birmingham, there was really only one option when wanting a top quality pie eating establishment! Urban Pie it was! Heading over to the Bullring, Pierateer RAS noticed that he had the added bonus of being able to cash in on a free pie, as he had eaten enough pies at Urban Pie to qualify for their “eaten 7 pies, get your 8th free!” promotion. Bonus! Choosing the Lamb, Potato and Veg pie with wedges, it sure filled the hole after a long few hours without eating a thing. While it certainly wasn’t the best pie flavour he’d had at Urban Pie (and believe me, he’s had a lot of them!) it was another fine example of fine Gourmet Pie dining with a takeaway edge. The full review will be added in the coming few days. 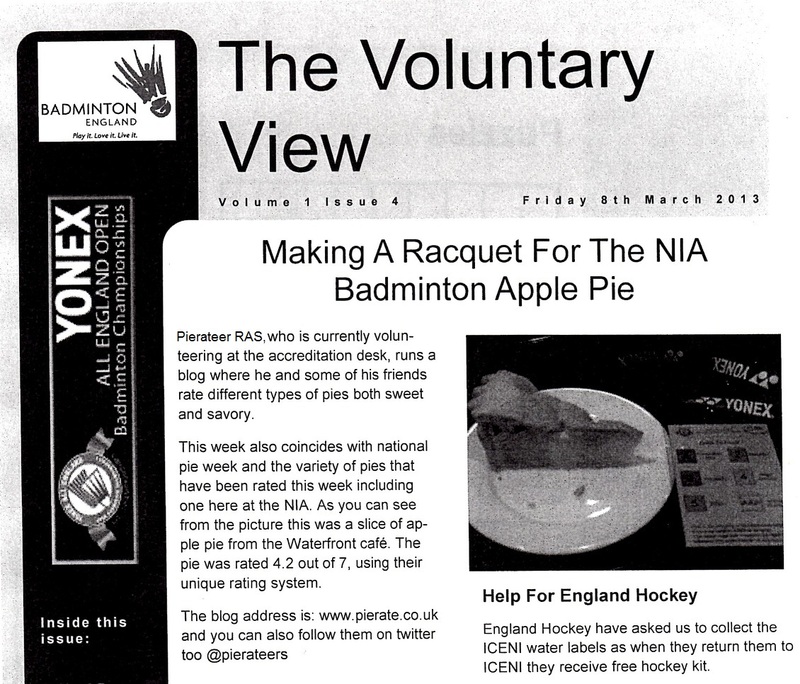 However there was further pierate news later in the day, as in the evening Pierateer RAS got handed a copy of “The Voluntary View” newsletter produced each day by a guy called James, aimed at summing up the day’s news at the YonexAll England Badminton Championships at the NIA. And low and behold, what should be the main headline of the day?! I’ll leave you to read it yourself! With it being PieDay Friday on British Pie Week, Pierateer TJP found it easy to assemble 5 work colleagues and head to Pieminister Farringdon (for the second time this week) for a pie. To attempt to try the whole range, TJP opted for the 'Deerstalker' venison pie. This was a lovely lovely pie, and will score highly when I post the review up soon. Using up some of the left over mash and veg from the Piezza SJL took a pie meal to work using an Asda Steak and Kidney shallow puff pastry pie, similar to the Chicken and Vegetable eaten on day three. Again the shallow shape worked against this pie, meaning there seemed to be a lack of filling. The only pieces of meat that SJL could find in this pie seemed to be kidney. At just 50p this pie is cheap but that really is the only thing that is going for it. To raise his pie spirits and to up the low pie count for the previous two days SJL also finished off two of the mini pork pies from the #onlypiesallowed challenge on Tuesday.